Target 1 monster in your opponent’s GY; banish it, and if you do, monsters with the same original name as that banished monster have their effects negated until the end of the next turn. We end the week off with the number 7 card and a card that was Semi-Limited before Konami saw the necessary evil that it was. From the Extreme Force Special Edition and Flames of Destruction, we have Called by the Grave. Called by the Grave is a Quick-Play Spell that when activated, you target 1 monster in the opponent’s GY and banish it and if you do, until the end of the next turn, its effects are negated along with all effects of monsters on the field with the same original name. This is mostly used to negate hand traps as those can really disrupt and stop your plays. Ash Blossom will stop your searching, Ghost Ogre will get rid of something, Veiler will negate a monster effect, all of that can be stopped by this card. Maxx “C” would be a big victim to this card if the TCG didn’t have it banned. 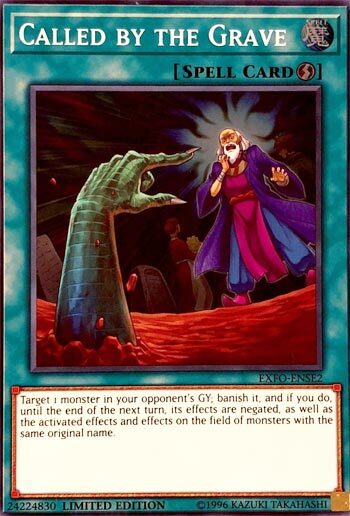 You can also use this to negate an effect your opponent activates on the field if they have a monster with the same original name in their GY. Called by the Grave is good for disrupting your opponent and making sure your plays go through. Run three of this in your main or side deck, it is worth it. Art: 3.5/5 I said it when we first reviewed this card, the art isn’t too inspiring. Called By The Grave was a saving grace in the meta this year, and comes in at #7. The best defense against hand traps, Called By The Grave can target a monster in the grave and negate the effects monsters with that name would activate until the end of the next turn. You need to banish the monster, which makes Imperial Iron Wall a hard counter to this card, but that is situational. This card can stop any searcher monster that goes to the grave that activates its effect, but lets be honest, this is to deal with the hand traps. Any hand trap has to go to the grave and can be negated by this card. Sure, it locks you out of using that specific hand trap until the end of the next turn, but it does that for your opponent as well. The meta had become overrun with hand traps bogging down main decks. Three Ash Blossoms, three Ghost Ogres, three Effect Veilers, three Ghost Reapers, it was too much. This card was run in 3’s until it got limited to 2, then was run in 2’s, and now it’s back to 3’s. A solid side deck card, and in some decks a set within the main deck. Don’t answer the call. Happy Friday! Called by the Grave is a free Quick Play Spell that lets you banish a targeted opponent’s monster in the grave. If that was it, it wouldn’t even beat Soul Release by much. After you banish said monster, its effects are negated as long as the effects of other cards with the same name from the hand or field until the end of the next turn. This is the anti-hand trap that you don’t have to set to prevent your opponent from messing with your turn. We can run this in 3s again so do so. This is also an excellent card against decks that run effects that cheat a name in the grave like Dark Magician, Blue-Eyes, etc. I wish this was out when Burning Abyss was top tier. Called by the Grave comes in at #7 closing out week 1 of our end of the year countdown. This might win the award for best common of the year, and one of the best ever (the best, in my opinion, still being Magical Scientist). This is a nifty, simple, Quickplay Magic card, that starts by letting you remove a Monster from your opponent’s Graveyard from play. This card work IN many Decks, but it doesn’t work against all Decks, but that doesn’t mean it isn’t good. When it’s useful, it’s very useful indeed. To start, removing an opponent’s Monster, whatever the reason, is all but certain to limit or eliminate a play from the opponent, and this can be used offensively or defensively. This locks the opponent out of whatever you removed using effect(s) of said card until the End of the next turn. It may not be the best card in a Main Deck spot in a Duel 1, as you might need a better idea of what your opponent is running, but I don’t see why this wouldn’t be a Side staple, at the very least. It’s a smart card, cause you need to be able to use it at the proper time, not just because the criteria fits, and I’m always a fan of cards that fit this category.